The Texas accent is a dead give-away. I write British crime novels—the Superintendent Duncan Kincaid/Inspector Gemma James series—but I’m as native to Texas as a twang and chicken-fried steak. So why the cultural schizophrenia? I’ve said I think I was born an Anglophile. From childhood I read, ate, slept, and dreamed England. My imagination seemed rooted there, and when I finally visited England for the first time in my early twenties, I felt as if every molecule in my body had suddenly lined up and clicked into place. Over the next few years I lived in England and in Scotland, and once back in Texas I found myself suffering from a profound sense of homesickness for Britain. Hence the idea for the series; logic suggested that if I attached my detectives to Scotland Yard, they could travel all over England investigating crimes and I would have an excuse to visit all the places they needed to go—and so it came to be. What I didn’t foresee was that over the course of fourteen (so far) novels, having based my characters in London, the city would become my second home. 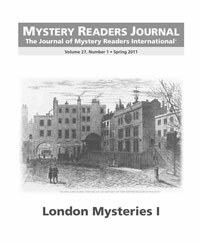 Although Duncan and Gemma and their colleagues sometimes investigate cases outside of the city (as in the upcoming No Mark Upon Her, which takes them to Henley-on-Thames), more than half the novels are set in London’s various neighborhoods, and at least some part of all the books takes place in London. This requires, obviously, that I should spend a great deal of time in London. Very clever of me, I say. Research in London? Oooh, sounds so glamorous, doesn’t it? London is glamorous, period. (Or “full stop” in Brit-lish.) It’s my favorite city in the world, and I love it with an abiding passion. Whenever I arrive in London, just taking the cab from Paddington Station makes me giddy. I love driving through familiar streets, or across Hyde Park, breathing London air (which just feels indefinably different), watching the whirl of black taxis and red buses and more-than-a-little-mad cyclists. This is a city where just getting from A to B (or A to Zed) can mean driving along the Thames Embankment, or past Westminster Abbey; where a regular bus route takes you down Baker Street; or where an evening concert means a walk across Westminster Bridge at sunset. History, and for writers and readers, story, are woven into every street and park and view. (The first place I sought on my very first trip to London? 110A Piccadilly—Lord Peter Wimsey’s fictional address. It was Dorothy Sayer’s subtle salute to 221B Baker Street, home to Sherlock Holmes.) You just can’t get away from detectives. I’ve often asked my London friends if they take this stunning city for granted. They always say no. Yet my detectives seldom are called to solve crimes in palaces or museums or the Houses of Parliament. Most cases, and my characters’ lives, happen in ordinary places. And what I’ve discovered is that it’s the ordinary places that fascinate me most. Most London neighborhoods grew from villages. Each has its own character and history, and I don’t think I’ll ever tire of the joy of the familiar (Notting Hill, where my characters live and where I stay most often; Kensington, Earl’s Court, Chelsea, Belgravia, Soho) or the thrill of discovering something, and somewhere, new. In the most recent book, Necessary as Blood, it was the East End, where thriving hip and multi-cultural London meets the specter of Whitechapel, the Kray twins, and Jack the Ripper. In a Dark House took me to Southwark, south of the river, borough of historic fires, docks, warehouses, and the London of Dickens’s childhood. In Where Memories Lie I got to explore the chic auction houses of South Kensington and the oh-so-elegant mansions of Chelsea’s Cheyne Walk. I see food seems to keep cropping up in this list—but food and drink are sensual and visceral, part of the complex of sight, smell, scent, taste, and touch that tie our memories and our imaginations to places, as they tie London to mine. London, in both its grandeur and in its small and intimate ways, becomes a character in the novels. I want to share this London—my London—with readers, to transport them, if I can, to this great sprawling hodge-podge of a city, to lead them into the places you don’t see from the Big Bus, the places where anything, and everything, can happen. And maybe, just maybe, I’ll spark someone else’s life-long love affair. Come along for the journey. It might be yours. Three-time Macavity winner Deborah Crombie is the author of fourteen Kincaid/James novels. No Mark Upon Her will be published by Macmillan UK in Aug. 2011 and Wm. Morrow in Feb. 2012. She is currently at work on #15. There’s a great quote from Barnes Wallis, the inventor of the bouncing bomb that destroyed the Ruhr dams in WW2, who said “There is nothing more satisfying than showing that something is impossible, then proving how it can be done.” That was what interested me about mystery writing from an early age. Well, that and my mother saying “If you write a book it will remain in the library long after you’re dead.” If any of you have read my memoir Paperboy you’ll know it’s typical of her to say “after you’re dead” to a nine-year-old. I write a weekly column for the Independent on Sunday called “Forgotten Authors,” about once massively popular authors who have now become a minority taste or who have disappeared altogether, and it’s surprising how many wrote over 100 books before vanishing into collective forgetfulness. They fade from popularity because tastes change, or their readers change, or the authors themselves change. While I was researching Margery Allingham, I discovered she regarded the crime novel as a box with four sides; “a killing, a mystery, an enquiry and a conclusion with an element of satisfaction in it.” Her plan was to reduce books like stock, to boil them to a kind of thick broth of a language that tasted rich enough to satisfy and left you wanting to copy down the recipe. Allingham also believed in the “plum pudding principle” whereby you provide your readers with a plum every few bites, to keep them interested in the whole pudding. Dickens famously did this, of course, and so does Mr Dan Brown. Allingham has an extraordinary richness to her writing—it’s allusive, witty, bravura stuff—but it’s a window to an English mindset that is now completely lost. And it appeals very strongly to me. I fell for Sir Arthur Conan Doyle because he conveyed the creeping pallor of Victorian street life, the fume-filled taverns where a man might find himself propositioned by a burglarizing gargoyle, the Thames-side staircases where gimlet-eyed doxies awaited the easily duped. Even his cheerful scenes felt vaguely gruesome; shopkeepers would drape a Christmas goose around a character’s neck like a feather boa, and the welcoming yellow light of a first-floor window could somehow suggest that its tenant was lying dead on the floor. Fog muffled murderers’ footsteps and London sunlight was always watery. The Holmes adventures were virtually horror stories. Men went raving mad in locked rooms, or died of fright for no discernible reason. Women were simply unknowable. And even when you found out how it was done or who did it, what kind of lunatic would choose to kill someone by sending a rare Indian snake down a bell-pull? Who in their right mind would come up with the idea of hiring a ginger-haired man to copy out books in order to provide cover for a robbery? Graduating to the Agatha Christie books, the initial thrill of discovering such plot ingenuity also created a curious sense of dissatisfaction. How was I supposed to identify with any of them? On my street there weren’t any colonels, housemaids, vicars, flighty debutantes, dowager duchesses or cigar-chomping tycoons. Certainly, none of our neighbours had ever attended a country house party, let alone found a body in the library. Nobody owned a library, and country houses were places you were dragged around on Sunday afternoons. I never went shooting on the estate—although there was a shooting on a nearby estate. At least Conan Doyle’s solutions possessed a kind of strange plausibility, whereas Christie’s murder victims apparently received dozens of visitors in the moments before they died, queuing up outside their bedrooms like cheap flights waiting to unload, and the victims were killed by doctored pots of jam, guns attached to bits of string, poisoned trifles and knives on springs. The only thing I ever learned from an Agatha Christie novel was the lengths to which county people would go to show how much they hated each other. I grew up in Greenwich, South London, and virtually lived in the public library. For the whole of my childhood I had borrowed three books every two weeks, until I became more familiar with the shelves than almost anyone who worked there. You know you’re comfortable in a public place when they let you walk about in your socks. It was a small library with a good librarian, a woman of thrillingly diverse tastes who stocked her shelves with the widest possible array of books. The first time I met her she scared me with a laser stare intended to weed out time-wasters. Greenwich council should have given her a gold medal. Instead, they plotted to have the place torn down and sold off behind her back. Many years later I came home to classic mysteries, with their academic eccentricities and timeless view of an England that never really existed. If you’re going to describe the investigation of a crime, you might as well have fun with it. So I did some more homework. I tried Sexton Blake and Raffles, who were so chinless you had to wonder how they managed to put a pillow-case on by themselves, but the early French masters were fun because they were sometimes dashing, like Arsène Lupin, or stubbornly peculiar, like Vidocq, and Fantômas. There were R. Austin Freeman’s charming Edwardian mysteries. Freeman invented the opposite of the Whodunnit, the “inverted mystery,” the How-Will-He-Be-Caught? puzzle. And there was Edmund Crispin, the spirited, funny man who composed six scores for the “Carry On” films and wrote eleven joyous Gervase Fen books between 1945 and 1951. Fen is Professor of English Language and Literature, and assumes that the reader can keep up with him as he spouts literary allusions while cracking crimes. There were also the seventy mordant mysteries of Gladys Mitchell, once judged the equal of Dorothy L Sayers and Agatha Christie. I wanted to create my own classic detectives like that. So Bryant & May were born. Arthur Bryant is a Luddite, antisocial, rude, miserable, erudite, bookish, while John May is likeable, friendly, modern, techno-literate, and a bit of a ladies’ man. Their inevitable clash of working methods often causes cases to take wrong turns. I made them old because I’m fed up with the ageism that suggests only the young can carry out their jobs well, and wanted to show that older characters could bring more talent and experience to crimefighting than those who are still learning. I wanted to explore my detectives’ careers from beginning to end, so Full Dark House was an origin story, kicking off with their very first meeting during wartime. I used the setting of old London theatres, because they have hardly changed in decades. London is full of unusual characters, so I use people I’ve met, including a British Museum academic who finds his enthusiasm getting him into trouble with the law, artists, lecturers, a white witch, members of the Gilbert and Sullivan society, a tough female Asian cop and a teen computer hacker. When you get talking to Londoners, you discover how many of them have odd interests and hobbies, and they’re often happy to share their passions with you. I look for secret experts, a WPC who recalls the history of every street she walks, a taxi driver who knows all about bridges, a bookshop owner who knows where to find unusual views of the city. Public sector workers are often keen to share quite surreal things they’ve seen or heard. People love to tell you what they know. Shop assistants are good because they know the habits of the public and are often too smart to be on tills, so they’re happy to chat. People smoking outside offices are more wary, and if you approach them with a question they assume you’re begging. How does a writer create a memorable detective? I started with a matchbox label that read “Bryant & May—England’s Glory.” That gave me their names, their nationality, and something vague and appealing, the sense of an institution with roots in London’s sooty past. I decided that London would be the third character; not the tourist city of guidebooks but the city of invisible societies, hidden parks and drunken theatricals, the people and places I show to friends when they visit. By making my own detectives elderly, I could make them simultaneously behave like experienced adults and immature children. Bryant, I knew, came from Whitechapel, was tortoise-like, scarf-wrapped, esoteric, eccentric, bad-tempered and myopic. He would wear a hearing aid and false teeth, and use a walking stick. John May was born in Vauxhall, was taller, fitter, more charming, friendlier. Every night, the detectives would walk across Waterloo Bridge and share ideas, because a city’s skyline is best sensed along the edges of its river, and London’s has changed dramatically in less than a decade, with the great ferris wheel of the London Eye lending it a raffish fairground feel. The hardest part was accepting the fact that after writing around twenty books I was once again a first-timer. Smart plotting wasn’t enough; situations needed to be generated by character. Recurring staff members appeared pretty much fully-formed. The rest of the team had to have small but memorable characteristics; a constable with a co-ordination problem, a sergeant who behaved too literally, a socially inept CSM—you can’t give them big issues if they’re going to be in several books, because you don’t want their problems to steal the spotlight from your heroes. I linked the Bryant & May novels with compounding clues and recurring characters as reward-points for loyal readers. Following the Barnes Wallis rule, I started the first Bryant & May novel with an explosion that destroys the detectives’ unit and kills Arthur Bryant. I created a police division, the Peculiar Crimes Unit, loosely based on a real experimental unit founded by the government during the Second World War, and added younger staff members who would be knowledgeable about the “new” London. I listened to oral histories of Londoners stored in museums, and ploughed through the diaries, notebooks and memorabilia hoarded by their families. The first of these “Golden Age detectives meet the modern world”-type mysteries was a success, and I got a two-book deal. For the second volume, The Water Room, the research was literally on my doorstep; my house was built on top of London’s forgotten rivers, so my tale concerned a woman found drowned in a completely dry room. The location was based on my old house, which sits over the River Fleet. You could often hear rushing water under the rooms. I usually explain that the strangest facts in my books are the real ones. As a location, London offers more anachronistic juxtapositions than most European cities—you’re likely to find a church on the site of a brothel—and it was important to find a way of reflecting this. Each story tries out a different kind of Golden Age mystery fiction; Full Dark House is a whodunnit. The Water Room is a John Dickson-Carr style locked-room mystery. White Corridor is an adventure in the style of Bulldog Drummond, and so on. The unlikeliest elements of these tales turned out to be mined from London’s forgotten lore; tales of lost paintings, demonised celebrities, buried sacrifices, mysterious guilds and social panics had casts of whores, mountebanks, lunatics and impresarios who have been washed aside by the tide of history—but their descendants are still all around us, living in the capital city. In the sixth book, The Victoria Vanishes, I began with a cheeky homage to Edmund Crispin, then dived into the hidden secrets of London pubs. When you’ve got nicely established characters your readers root for, you can start playing games. The mysteries may look like “cosies,” but I’ve had Bryant & May release illegal immigrants into the social system, illegally disrupt government offices and even commit acts of terrorism in order to see that justice is done. This isn’t particularly profound stuff, but it’s real enough to place the stories just inside a world of recognizable prejudices. In the latest books, Bryant & May on the Loose digs into the murky world of land ownership in London, and Bryant & May Off the Rails does something similar for the underground system. The next, The Memory of Blood, looks at the English legend of Punch & Judy. I blog on my website every day for an hour and a half, to encourage talk about books, and I get messages from all over the world. The site has since been nominated for awards, but I do it because it’s great to reach out to your audience and get their feedback. The days of authors sitting back and letting their work and their publishers speak for them has gone, and now the onus is on us to deliver the readership. But books are pre-chosen for promotion by publishers, and most titles don’t get the benefit of a Dan Brown budget. The Bryant & May series should never have worked. The good news is that there are now nine volumes with another to come, a graphic novel called The Soho Devil is nearly finished and there’s a TV series in the offing, so I did find a discerning readership. Did I succeed in creating memorable detectives? Only time will tell. But if having fun while unlocking knowledge is any sign of accomplishment, I guess the Bryant & May files will remain open for some time yet. And if you’re wondering how I cope with the fact that Bryant & May are ancient and getting older, I have a suitably outrageous solution for that too, in the new book. I hope the series continues, but in case it doesn’t I’m writing a thriller, and a sequel to my memoir Paperboy. About one third of everything I write to a highly finished standard doesn’t get published. These books and stories go into drawers or onto flash drives, to be relinquished with a sigh and a shake of the head. The important thing is to remain enthusiast and hopeful of finding your audience. I thought we would always need stories, until I saw the ITV chief in an interview, saying that fiction was no longer needed on television. But so long as there’s someone out there who remains enthusiastic about some of what I write, I’ll write. And I’ll always try to raise the stakes. That’s what writers do, and what they always should do. The world changes fast. We have to be just a little bit faster. Find out more about Christopher Fowler’s writing and characters at his two websites, www.christopherfowler.co.uk and www.peculiarcrimesunit.com.